In Windows, you don’t always need to know the actual password to get onto a system (believe it or not). All you need is the hash of that password, and you can get in just as easily. This is meant to simply be an extension to the previous post. Simply use a Windows 7 system. All you need to add is a single Windows share. What you share doesn’t matter. The same password hashes that were found before will be used again. You may need to set a registry key in case you have an error listed later. The key is “HKEY_LOCAL_MACHINE\System\CurrentControlSet\Services\LanManServer\Parameters” with “RequireSecuritySignature” set to “0” (as described here. I did not need this, but notice that is a good mitigation). Another registry key you may need for the same error is under the following: “HKEY_LOCAL_MACHINE\SOFTWARE\Microsoft\Windows\CurrentVersion\Policies\System”. This time you’ll need to add a new DWORD (32-bit) called “LocalAccountTokenFilterPolicy” and set it to 1 (as described here and here. I DID need this). Basically, local users by default are not allowed to perform administrative actions. This registry key gets around that problem. A domain account would not have this issue. All you need is a password hash to a system that has SMB file sharing open (port 445). Metasploit has a pass the hash module called exploit/windows/smb/psexec. In fact if you run a “search psexec” on the Metasploit console, you’ll see about 4 modules to use pass the hash for different things. For our host, we’re simply going to use psexec to drop a meterpreter payload. This means you didn’t set the registry keys explained in the Setup step (likely the second one). This entry was posted in practical hacking, tools and tagged metasploit, pass the hash, passwords on February 21, 2013 by admin. Grabbing passwords is an important part of penetration testing. You can use the passwords you grab for island hopping, or just simply for shock factor in your report (which can be just as important to generate change). Simply setup a machine running Windows. I’m on Windows 7, 64-bit, so these are the tools I’m running. First step is to grab the password hashes of all the accounts. Different systems hash their passwords in different ways. Windows 7 uses NTLM. One great tool for grabbing passwords is called fgdump. Simply download it, and then run it in a command prompt window. It will output the results to a file. You may notice some mention of pwdump when researching fgdump. 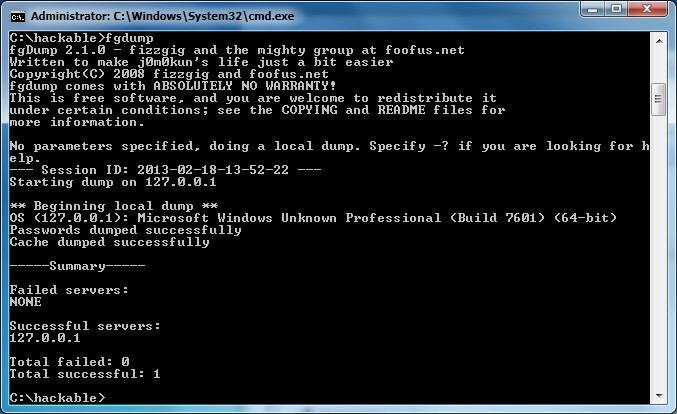 Pwdump is simply an older version of fgdump, with less features. You can see there are 3 users. Two of them don’t have a password, but the 3rd (JoeTest) does. His username is JoeTest, with a userID of 1001, no LANMAN password stored, but a NTLM password of E5810F3C99AE2ABB2232ED8458A61309. So what does that mean? Well sometimes Google is the best password cracker. Paste that text into Google, and you’ll see that it is simply asdf. Other ways to get passwords include John the Ripper (CPU based cracking tool), Hashcat (GPU based cracking tool), and Ophcrack (Rainbow table password cracking tool). Details on using those are beyond the scope of this article, but all 3 will crack NTLM passwords. One neat thing about Ophcrack is if you have physical access to the machine, you can simply boot it to an Ophcrack Live CD, and let it find and crack the passwords automatically. Of course if you already have physical access to a machine in a pentest, you can probably consider the engagement done with everything compromised already. An even better way to grab passwords is to do so in cleartext. In comes WCE (Windows Credential Editor). Just running wce from the command line will also dump the hashes, but running it with the -w flag will grab the credentials in cleartext from memory. As you can see, the password clearly shown is asdf. This won’t always grab all the passwords in the system, but it sure helps for the ones it does grab. Another tool that works in the same way as WCE (not in English, but less likely to be caught by anti-virus) is mimikatz. You can try that tool as well. This entry was posted in practical hacking, tools and tagged cracking, fgdump, passwords, pwdump, wce, windows credential editor on February 18, 2013 by admin.